By Andrew Chung WASHINGTON, Nov 7 (Reuters) – U.S. Supreme Court justices appeared divided on Wednesday as they weighed an effort by Sudan, backed by the U.S. government, to avoid paying $314.7 million in damages to American sailors injured in a 2000 deadly bombing of the Navy destroyer USS Cole by the al Qaeda militant group. 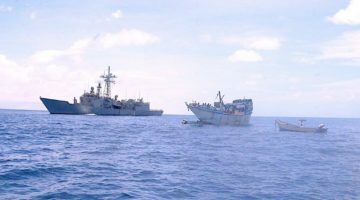 The justices heard oral arguments in Sudan’s appeal of a 2015 lower court ruling that allowed the sailors to collect the damages. The dispute centers on Sudan’s contention that it was not properly notified of the lawsuit when the claims were delivered in 2010 to its embassy in Washington rather than to its minister of foreign affairs in the Sudanese capital Khartoum, as required by U.S. and international law. The administration of President Donald Trump agreed with Sudan, saying the case could impact how the U.S. government is treated by foreign courts since the United States rejects judicial notices delivered to its embassies. Some justices appeared sensitive to the government’s arguments. Trump’s newest appointee to the court, Justice Brett Kavanaugh, suggested that a lawyer for the sailors, Kannon Shanmugam, was downplaying the problem despite a major international treaty on diplomatic relations. “The United States and all the countries in the Vienna Convention all seem to say, actually, it is a big deal,” Kavanaugh said. Justice Stephen Breyer, a liberal, said a suit might better reach the proper authorities if sent to a foreign ministry abroad. Some other members of the court appeared to back the sailors. Chief Justice John Roberts said it might be more “convenient” to receive a notice at an embassy. The case follows the injury of 15 sailors in the Oct. 12, 2000 attack, after which they and three of their spouses sued Sudan in 2010, accusing it of providing material support to help al Qaeda carry out the bombing. Sudan denies the allegation. The attack killed 17 sailors and wounded dozens in the southern Yemeni port of Aden. In 2012, a federal judge in Washington issued a default judgment of $314.7 million against Sudan, which did not appear in court to defend itself. A separate judge in New York later ordered certain banks to turn over assets they had held for Sudan to partially satisfy the judgment.